Are My Sites Up? - Website monitoring - Simple, easy website uptime and website downtime monitoring since 2009. Have a Stripe account? Stop losing money due to failed payments. Are My Sites Up? 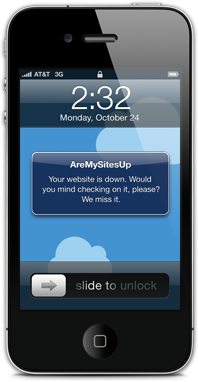 - Website monitoring - Simple, easy website uptime and website downtime monitoring. 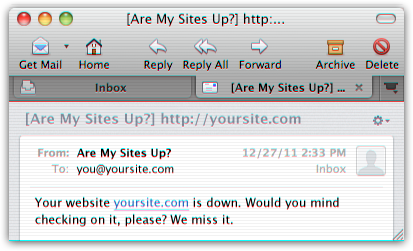 When your websites go down, be the first to know. Your clients and/or customers don’t care that a hamster chewed through a network cable somewhere in Northern California. They want their website up. You need to find out before they do so you can react fast! Our plans will check your sites as frequently as once per minute. You get unlimited email and SMS notifications (in the US, International SMS is available) and we will do our best to tell you why your site was down by providing the HTML status error code, when possible. We also provide an iPhone application, RSS feeds, webhooks, keyword search, premium-level support, email notifications to multiple addresses, multiple user accounts, voice calls and more! Are My Sites Up is powered by and endorses Joyent hosting.